FOR SALE: $975,000. FOR LEASE: $2,000 per month plus utilities. Historic building in the Bowery District of downtown Apalachicola, circa 1900. One block from the river with river views. The renovation, completed in 2015 by local craftsman Mel Livingston, preserves the original features and rustic charm of this memorable building. The salvaged and reclaimed local building materials were hand selected and strategically placed to recreate the ambience of the early 20th century. 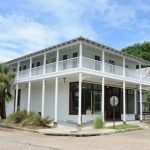 Downstairs space, currently offered for lease, includes a spacious open area with display windows, high ceilings, 2 half baths, small office with separate entry. The upstairs is the self-caterings Bowery Inn with four room, each with a private bath, plus a community area with refrigerator, coffee, microwave, laundry room. The entrance for the Inn is at ground level on Ave G. Most furnishings included.